To change the height of the seat cushion, move the lever upwards or downwards. 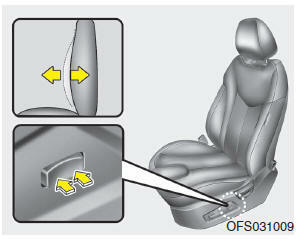 Pull the front portion of the control switch up to raise or down to lower the front part of the seat cushion. 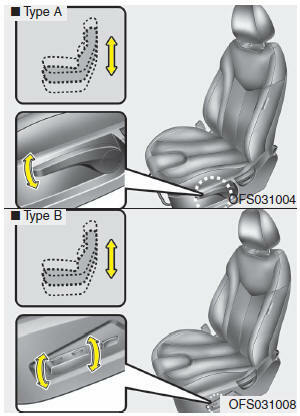 Pull the rear portion of the control switch up to raise or down to lower the rear part of the seat cushion. Release the switch once the seat reaches the desired position. 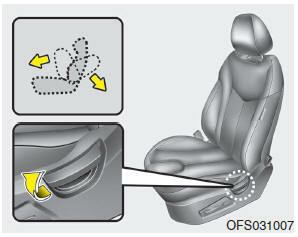 The lumbar support can be adjusted by pressing the lumbar support switch on the side of the drivers seat. Press the front portion of the switch to increase support, or the rear portion of the switch, to decrease support. If you pull the lever to backward, the driver seat will be folded. 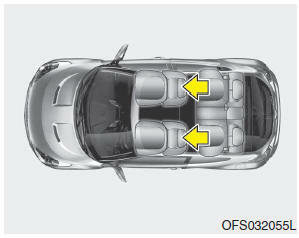 You can get out from rear seat to outside. While driving, do not control the lever. If not, the unexpected accident may occur. 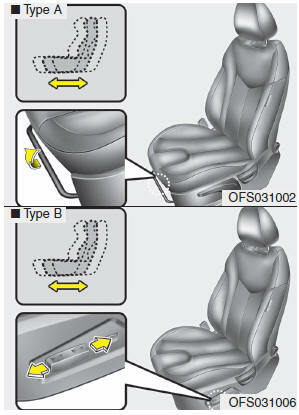 The front seat can be adjusted by using the control switches located on the outside of the seat cushion. Before driving, adjust the seat to the proper position so as to easily control the steering wheel, pedals and switches on the instrument panel. • The power seat is driven by an electric motor. Stop operating once the adjustment is completed. Excessive operation may damage the electrical equipment. • When in operation, the power seat consumes a large amount of electrical power. To prevent unnecessary charging system drain, don’t adjust the power seat longer than necessary while the engine is not running. • Do not operate two or more power seat control switches at the same time. Doing so may result in power seat motor or electrical component malfunction. 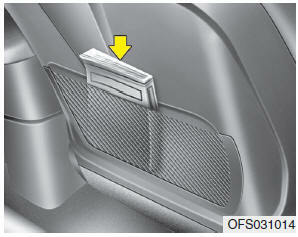 The driver's and front passenger's seats are equipped with a headrest for the occupant's safety and comfort. The headrest not only provides comfort for the driver and front passenger, but also helps to protect the head and neck in the event of a collision. • For maximum effectiveness in case of an accident, the headrest should be adjusted so the middle of the headrest is at the same height of the center of gravity of an occupant's head. Generally, the center of gravity of most people's head is similar with the height of the top of their eyes. Also, adjust the headrest as close to your head as possible. For this reason, the use of a cushion that holds the body away from the seatback is not recommended. • Do not operate the vehicle with the headrests removed as severe injury to the occupants may occur in the event of an accident. 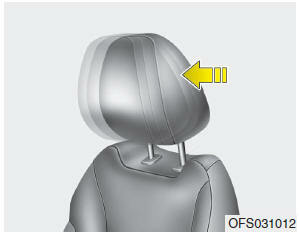 Headrests may provide protection against neck injuries when properly adjusted. • Do not adjust the headrest position of the driver’s seat while the vehicle is in motion. 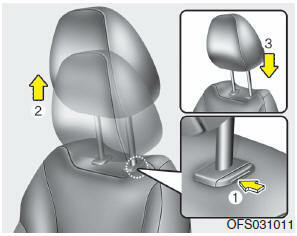 The headrest may be adjusted forward to 3 different positions by pulling the headrest forward to the desired detent. To adjust the headrest to it’s furthest backwards position, pull it fully forward to the farthest position and release it. 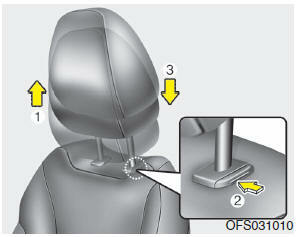 Adjust the headrest so that it properly supports the head and neck. 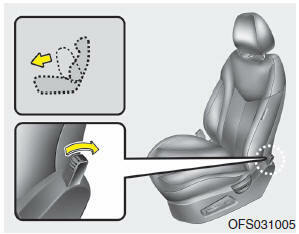 Make sure the headrest locks in position after adjusting it for proper protection of the occupants. 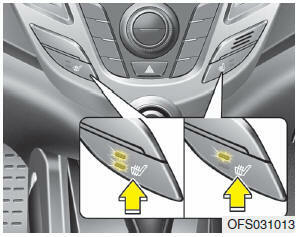 The seat warmer defaults to the OFF position whenever the ignition switch is turned OFF. During mild weather or under conditions where the operation of the seat warmer is not needed, keep the switches in the "OFF" position. • With the seat warmer switch in the ON position, the heating system in the seat turns off or on automatically depending on the seat temperature. • If the seat warmer doesn't work when the ambient temperature is below 21 °C (70 °F), have the system checked by an authorized dealer. • When cleaning the seats, do not use an organic solvent such as thinner, benzene, alcohol and gasoline. Doing so may damage the surface of the heater or seats. • To prevent overheating the seat warmer, do not place blankets, cushions or seat covers on the seats while the seat warmer is in operation. • Do not place heavy or sharp objects on seats equipped with seat warmers. Damage to the seat warming components could occur.